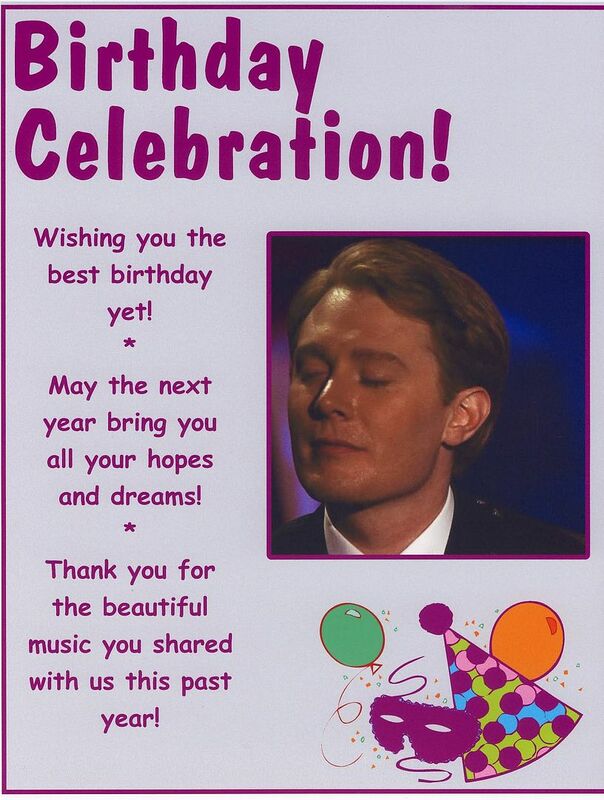 In the past few years, Clay Aiken has been very busy on his birthdays. In 2004, Clay helped Light Up the Rockefeller Christmas tree. In 2008, Clay was starring in Spamalot on Broadway. In 2006, Clay gave Lynda Loveland a tour of his new home in North Carolina………well, at least the tour was on TV on his birthday. For two of Clay’s birthdays, he was performing on tour. In 2007, Clay performed in Kalamazoo, MI and in 2005, he performed The Joyful Noise Tour in Reading, PA. The audience in Reading was ready to party with Clay in 2005. The audience had paper birthday hats, glow sticks and even gave Clay a huge “pointy hat” that was signed by some fans. The following video shows the fun at the end of the concert in Reading. The best part is towards the end when Clay actually wears the birthday hat. As we enjoy the video, I hope that Clay is enjoying his special day, surrounded by his family and friends. I am sure each one of us wishes him the very best!!! That video was fun to watch again…Thanks CANN. Another Clay Birthday for all of us to celebrate. HAPPY BIRTHDAY Clay. What fun to watch the video again. Gotta love Christmas Clay. Thanks CANN. This is the last day to vote for National Inclusion Project and the kids. Let's give Clay a real present by getting in the Top 10 today and getting $50,000 for the kids. I was hoping that we could win the Pepsi Challenge for Clay on his birthday, but not this time. We'll try again for a Christmas present for Clay and all the children who want to go to camp. I hope you have a WONDERFUL birthday Clay!!!!!!!!!!! Error: Error validating access token: Session has expired on Tuesday, 21-Aug-18 16:13:01 PDT. The current time is Tuesday, 23-Apr-19 00:09:00 PDT.